In addition to solving the logistical problems associated with tax season, virtual data rooms have business benefits that provide a clear return-on-investment. Robin Narcisso and Jolene Griffith, controllers for growing tech company, AppFolio, share how they have saved time, reduced expenses, and the allieviated the general dread that comes with tax preparation and related activites by using a virtual data room to store their companies sensitive documentation year round. 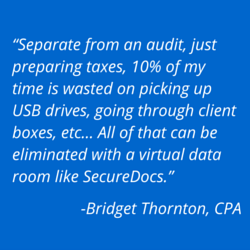 Businesses can reduce tax preparation time by days or weeks if they have an ongoing up-to-date virtual data room. It eliminates the need to locate, pull, organize and then re-file tax documents from a physical filing cabinet. It eliminates duplicate requests and responses for additional documents by providing accountants and auditors access to one folder with all documents. It eliminates the need for jump drives and the risks and costs of mailing or using fedex to send documents back and forth. It eliminates the risk of exposing employee data to another environment where security is unknown. Encryption of all client data helps CPAs and auditors protect client data. Because tax files can be accessed remotely, companies can reduce on-site time and time expense needed to accommodate accountants and auditors. Robin and Jolene both commented that their 401K audit was done remotely with no on-site visit needed. “The auditor did come by our office, but it wasn’t to go through our files, it was to take us to lunch!” Jolene exclaimed. 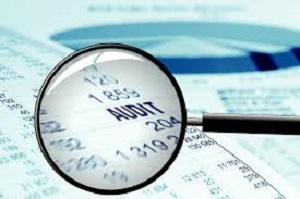 Furthermore, they were able to separate out the 401K audit information from other employee documents so that those documents didn’t come under unnecessary scrutiny as is often the case when documents like visas are grouped together in a physical folder that an auditor reviews. Virtual data rooms are a better solution than Dropbox or other collaboration solutions when communicating with accountants and auditors. Managing access to various employees using different accounts with little control over where the sensitive information could end up. In addition, because Dropbox is a collaboration solution, they had issues with version controls and updated draft conflicts when more than one person was working on the document at the same time. By nature, many of the documents supplied to accountants and audit teams are completed documents not meant for further manipulation. Virtual data rooms provide an ideal secure solution for tax and audit preparation, saving companies both time and costs. Although it doesn’t take away all the pain of taxes, it reduces the issues significantly. Like an anesthetic that reduces pain and allows the dentist to work faster, a virtual data room eases the burden on companies when it comes time for those regular visits with accountants and auditors.